The Subkick is a cleverly conceived and well-made item. You'll need to be a fairly busy player already in possession of a bass drum mic with access to a proper PA system to be in a position to even consider investing in a Subkick. But for those of you that are, it is worth taking a listen to. Locates the lower frequencies that other mics cannot reach. Specialist piece of equipment, requires a full PA rig or a well-equipped studio for recording to achieve desired effect. The stand enables vertical positioning in front of the bass drum. The Subkick represents a near solo effort by Russ Miller. Long-term Yamaha endorsee, Russ Miller has revealed himself to be something of an innovator from behind the drawing board as well as the kit. Combining a player's creative imagination with a thorough appreciation of engineering, he has worked closely with Yamaha's research and development team on projects such as his Groove Wedges. The Subkick represents a near solo effort of Russ's. Resembling a snare drum with a speaker housed within it, the Subkick is known technically as a low frequency capture device. In other words, it's a whopping great microphone that picks up and processes the low subfrequencies from the bass drum that are normally easier to feel than hear. Using a speaker cone to create a large diameter microphone is not as outlandish as it might at first sound. Speakers and microphones contain similar hardware and operate along the same principles, using vibrations to harness sounds and turn them into audible signals. In some bigger studios in the USA and UK a few inventive engineers have tried creating their own low frequency mics by experimenting with reversing loudspeaker cones. Russ has taken a logical step further in housing the speaker cone in a tunable drum. The shell encourages sympathetic vibrations making the detection and capture of said vibrations more likely. As it is tunable, the drum can also be tailored to match an individual drum's frequency zone. It is also a neat package for the whole caboodle. The outer drum of the Subkick is a straightforward 10"x5" seven-ply Philippine mahogany shell, fitted with standard lugs and hoops. Suspended within the shell is the driver cone, which is 16cm in diameter and rated at 50w. Its nominal frequency range is 50Hz-2kHz. The driver cone is enclosed on both sides by mesh heads, which can be tensioned or slackened in the normal manner via the tuning rods. Output to a PA system or mixing desk is via a single XLR socket located in the shell. The unit is phantom powered so requires no battery or external power source. 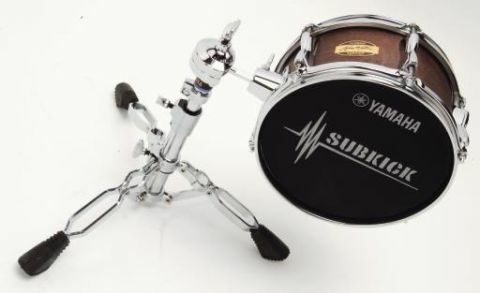 A supplied stand with a ball and socket holder enables the Subkick to be positioned vertically in front of the bass drum. In order to get anything like the intended effect in a live scenario, then a PA system equipped with bass bins is absolutely essential. As the Subkick only deals with ultra-low frequencies, it is necessary to use a conventional mic with it to ensure the kick drum has suitable attack alongside the wave of low frequencies. In the studio, Russ recommends trying out the Subkick on its own to replicate the super low 808-style drum sounds that have found their way onto countless recordings. We didn't take the Subkick into a studio, but a gigging set-up provided an excellent test for it. Using an 18" bass drum and mic through a full PA rig that includes bass bins. The mic is pretty decent and does a good job of pulling a big sound out of a small drum, but the contrast when the Subkick was dialled into the mix was jaw dropping. New depths of bottom end appeared, transforming the sound of the drum from impressive to outstanding. The level of low frequencies being pushed out seemed endless. Taking the Subkick out of the equation briefly and then dropping it back in confirmed its extraordinary effect. Russ Miller is certainly no slouch behind the kit and he could be equally successful as a visualiser and designer. The subkick delivers a previously elusive surge of controlled bottom end to the front of house. The cost is around the same as that of a high quality bass drum mic.